© 1949 Fred Rose Music, Inc.
a fragment was in included in D. A. Pennebaker's documentary "Don't Look Back". Possible inspiration for Dylan's "Like A Rolling Stone." The tune is (in my opinion) related to that of "Oh Bury Me Not On The Lone Prairie." Dylan's likely source: Hank Williams, MGM matrix 49-S-6032, Mar 1, 1949. Payne was a blind musician who worked out of Jerry Irby's nightclub in Houston and guested on the Hayride and the Opry. 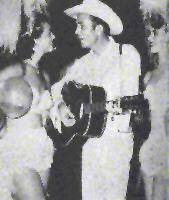 His original version... had been released on the Nashville-based Bullet label in October 1948. Colin Escott, Hank Williams - The Biography, Boston, 1995, p. 98. In the early days of Leon's career, he hitchhiked from one place to another, finding jobs wherever he could. Once he was in Califonia hitchhiking to Alba, Texas, to visit his sick mother. He was unable to get a ride and finally got help from the Salvation Army. It was while he was waiting for help that he wrote this song. Telephone interview, Dec 20, 1972; reprinted in Dorothy Horstman, Sing Your Heart Out, Country Boy, New York, 1976, p. 368. You started rollin' down that lost highway.